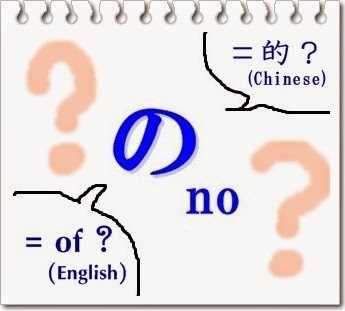 TODAY IS A GIFT: の = of ? How do you "output" your target language? Do you have a language exchange partner? Do you go to a conversation class and have speaking activities? It's great if you have a chance of speaking your target language! Here it is, NO! No? No, no, it's the particle の/no/ !! It's mainly used to show possession. My father's socks are stinky. This stinky socks are my father's. I found it in the corridor, but who's underpants are these? In this case, の can be directly translated into 的 in Mandarin Chinese. If you're mother tongue is Mandarin, you have to mind that 的 can't be always translated into の in Japanese. 的 in Mandarin is inserted between the adjective and the noun, but it's different from Japanese grammar. You see, 臭いの靴下 is wrong. By the way, if it's na-adjective, you should put な before the noun. Anyway, here're some other functions of Japanese particle の!! I left my mobile on a bus. There's a nice ramen shop beside the library. The one who has long hair is my younger sister. I want the one which is smaller. Who's the one that was crying a short time ago? It makes the sentence sound soft. It sounds kinda womanish if you use it too much times! Okay, let's call it a day! Thank you all for reading my blog, and thank you Hirou, for suggesting me to write this post. =) See you again!